Key difference: SSN is an abbreviation for Submersible Ship Nuclear, whereas SSBN stands for the Submersible Ship Ballistic Missile Nuclear. They both are attack submarines. The difference between the two is based on their design and primary functions. Submarines are considered as a guaranteed source of strength. It is because they are known for their intense power of destruction. For countries that are looking to strengthen their defense against an invasion or a threat, nuclear submarines are on top of their weapons list. The SSN and SSBN run on the power provided by nuclear reactors. The SSN is commonly referred to as a fast attack submarine. The major difference between these two are the primary functions that they are designed to undertake. The Submersible Ship Ballistic Missile Nuclear is designed to launch the structure of fast missiles or ballistic missiles with nuclear warheads. According to Wikipedia, the SSBN in the US Navy is a classification symbol for a nuclear-powered, ballistic missile-carrying submarine. The SS denotes ‘Submarine’, B denotes ‘ballistic missile’ and N denotes ‘nuclear powered’. In naval slang, the submarine is referred to as ‘boomer’. The SSBN is solely used in strategic attacks. 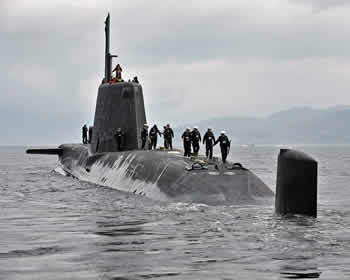 On a regular basis, the submarine goes into the waters and takes an undetected position in state of a nuclear attack. Usually, two crew members are placed in the operation of the submarine, where one member takes it into the waters and the other member is situated at the ports. The SSBN carries a collection of ammunition which includes the Tomahawk cruise missile. It is considered to be the ‘killer’ in the submarine world. It does go under water for a long period of time i.e. nearly half a year. During its time in the sea, the submarine avoids all contact and being detected by any other submarines or surface ships. The ballistic missile submarines differ in their purpose to attack other submarines and cruise missile submarines. They specialize in combat with other naval vessels, which include enemy submarines and merchant shipping. They are also designed to attack large warships and tactical targets on land. The primary mission of the ballistic missile is nuclear detection and the mission profile of this submarine is to remain undetected. They are designed for stealth, many use sound-reducing design features, to have propulsion systems, and have machinery mounted on the vibration damping mounts. Ballistic missile submarines are equipped with nuclear warheads. The invisibility and mobility of submarines offer, both, a reliable means of deterrence against an attack and a surprise attack capability with a particular given range of the weapons. In World War II, the Submersible Ship Ballistic Missile Nuclear was considered as the most credible due to its ability to survive a nuclear attack from the USA. The Submersible Ship Ballistic Missile Nuclear was able to fight back through the launch of the Trident missiles. The SSN is a nuclear powered general all-purpose attack submarine. SSN in the US Navy is used as a classification symbol for submarines. The SS denotes a submarine and the N denotes nuclear power. The SSN are designed to track down and defeat both, the SSBN and the enemy aggression. They can also very easily detect any surface warheads with the help of the cruise missiles. These submarines also are used in the attack of particular targets on land by the launch of the fast missiles by use of the torpedo tubes. The Submersible Ship Nuclear carries the cruise missile with explosives which are used to attack the assailants within the shores. The other purpose of the submarine ship is to conduct surveillance, perform and complete intelligence missions, so they can offer aid in highly classified operations. The size of this ship is moderately big. The SSN is used to make attacks to assailants in the nearby distance. It is considered war prone and looks for enemy ships to destroy them. The SSN submarines have evolved into multi-mission submarines. Their roles include submarine-launched cruise missile platforms, intelligence gathering platforms, insertion and infiltration of Special Forces teams, in addition to the traditional hunter and killer role. They have longer endurance and high speed. A few disadvantages of the submarine are the technical challenges and the large expenses caused by the building, refueling and mainting of the nuclear reactor. SSN is an abbreviation for Submersible Ship Nuclear. SSBN stands for the Submersible Ship Ballistic Missile Nuclear. It is used to attack the assailants in the nearby distance. It is used to launch missile attacks to far distances. It is war prone, as it looks to destroy the enemy ships. It keeps its position secret from other ships or submarines. It is general all purpose attack submarine. It carries out strategic attacks.